Can the 2SC1971 transistor on the MaxPro 1 be direcetly replaced with a 2SC1972? Would the 1972 still run at 7watt like the 1971 did or would it run at 14watt? If not what would happen? Any information any has on this subject would greatly be appreciated. I have several 50watt amps that require 14/15 watt input and it would be great to have them run at 50watt, fed from a MaxPro 1, rather than running them at about 25watt out put which is what they currently run at with MaxPro 1's 6/7watt input.. It will not work. 1972 requires more drive, among other things. The heatsink part is essential, you need to give it an opportunity to shed heat. I fried the 2SC-1971 by pushing it with 16V and sinking it to the steel cover of a 1U rack mount enclosure (the steel couldn't move heat fast enough), however with an NTE342 and a modified PC CPU heat sink (lookee here, a bunch of overkill with the fans too) I've been running 7.5W+ 24/7 for a couple months. The '342 is rated for 7W "typical" and 12.5W "max" if you can keep it cool. I can get 9W at 17V, but to be "conservative" I'm running 7W at a bit under 16V with the onboard trimmer at about 90% (the PM1 like most devices is quieter [audio] when not pushed all the way)--I can easily hit 9W at 17V and max onboard gain. Last night i spent 5 hours machining a heatsink bigger than thart in the photo you linked to, it runs the full length of the MaxPro1 board, and is just a bit wider than the one shown. It was a proper heatsink i purchased from a developer suppliers, which i polished with an electric hobby tool for an hour. I then bonded it with a little smear of heatsink compound just to make sure the heat transfer is as efficient as possible. I like that picture, that's someone who took a lot of time to make a great job of their board. I'm trying to do the same! I ordered a second 2SC1971 as a back up, and it sits taped inside the enclosure as an emergency spare but i'd really like to experiment in an increase of power. All my amps only get tickled by 7 watts, they need a little more. If i ordered one of those transistors you mentioned, could i just unsolder the 1971 and drop the new one back in without having to alter values of resistors, capacitors etc? I have a 40amp switch mode power supply, variable voltage from 5- 19v DC, it wasn't a cheap one either! Thanks for replying - much appreciated! I'm sure there is a way of running the stereo encoder and other extras at 13.8v and the MaxPro1 at 16v from the same supply??? Which stereo encoder? It will probably work at 15V just fine. I don't recommend more than 15V for max pro I. Not a very good one lol! It should work at 15V. If not, do yourself a favour and get SE3 at least. Better yet, look at SE4 DSP+. Hard to beat that one. >maybe you didn't get it? Yahoo keeps reporting my yahoo email address as <BULK> in peoples inboxs. Have you got a MaxPro1 lcd display left you can sell me? I got an led segment one with mine and although it's functional, it makes the unit look a bit dated in comparison to all these lcd exciters on the market. I can live with the led segmant, but it does irritate me knowing everyone else has the joys of lcd! Will do, i'd have made do with the led segamant one but it has a dodgy digit that keeps going out and you have to flick it to make it come on again. Nothing serious but a good enough reason to upgrade it i suppose. These LED displays haven't been produced in a while, indeed. To produce any truly significant increase you need a outboard amplifier like those sold here and elsewhere. I have an amplifier, that's why i need the a bit more wattage. 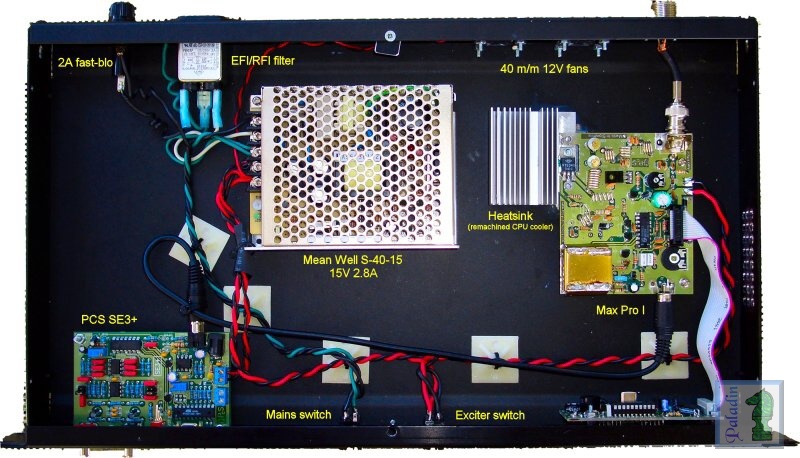 I have a 50watt power amplifier that requires 12-15w in to get 50w out. Feeding it with 6w gives just 20w, and 7w in gives 27w out. I really want these amps running nearer 50w, but it seems silly to buy another amp (1w in with 15 out) to power the 50watt amp, and feed the little 15w with the MaxPro turned down to just 1 watt. It's badly inefficient, and 15w amps are too much money, all amps are over-priced, and when i could maybe mod the MaxPro1 to 10watt out, then i'm nearly there and should get about 40-45watt out the main amp which i can live with. I begrudged paying what i did for the 50watt amp, let alone now needing to buy a second to go inbetween! 15W for 50W output, oh my god. It's a commercial power amplifier made by the famous PYE of CAMBRIDGE. They were made for their car installation radio-telephones when they used 104-108MHz before the UK broadcast band was expanded from 88-104MHz to 88-108MHz. They are an amazingly robust and indestructable amplifier with absolutely superior filtering. Yes, they take a high input in comparisson with specially made amps for fm broadcast, but they will happily run 24/7 365 days a year without getting warm, and a nuclear warhead wouldn't scratch the casing and the price makes them a very tempting solution. They were available with many different band coverage. 66-88 E0 band, 88-108 M0 band, 104-108 M1 band, and so on. They are easily fine tuned for optimum performance and they can be picked up in large supplies for very cheap prices. I paid dear for mine because i needed it there and then and couldn't wait for some to appear for sale elsewhere, but even so i'm more than happy with it. They are very popular with amateur ham radio users, who convert them for all sorts of frequencies, so they can't be that bad. Plus they don't even need converting for the broadcast band. M0's and M1's are perfect and fine tune for any broadcast frequency with ease. Take a look below, i couldn't find the pages i was looking for, but it's mentioned here and there on the web pages linked to below. Oh, and here's the pictures of my heatsink i fitted to my MaxPro1, and the led segmant display that is a bit dodgy (one segment goes out, you have to flick the thing to get it back on. Nothing serioues but done it since first use) which i would like to replace for a lcd liquid crystal display. Are your lcd displays backlit? Do you have both types (led & lcd) in stock? i know heheheh i was planning on modding the thing to around 10-15w out if possible, but i'm rapidly giving up on my idea. Atleast it will run 24/7 unattended now i hope, i keep a spare 2SC1971 taped inside the housing anyway. Doubt i'll need it now. Doubt i'll even need a fan!!! No-ones made a 14watt MaxPro1 mod yet, and it's slightly beyond me to recalculate the same circuit board for new componants. I thought maybe someone knew a simple transistor and a couple of componants swap but apparently not so i'll have too buy a newer MaxPro!